For the first time this year, we grew butternut squash. It is wonderful how long this vegetable keeps when in the right environment. We are lucky enough to have a basement which maintains a pretty constant temperature — kind of like a root cellar in a sense. These squash were probably picked a month and a half ago and when I went down to get them for this recipe, I was so amazed at how well they looked and kept their firm shape. Lucky for us we have about 10 more down there which we'll be eating well into the new year. Butternut squash is already on the list to replant in our 2012 spring garden! Giving credit where credit is due, I was reading the Etsy blog on Thursday which prompted me to fix this particular fall recipe. I did switch up one thing in that I used black walnuts instead of the roasted chestnuts — the choice is certainly yours. 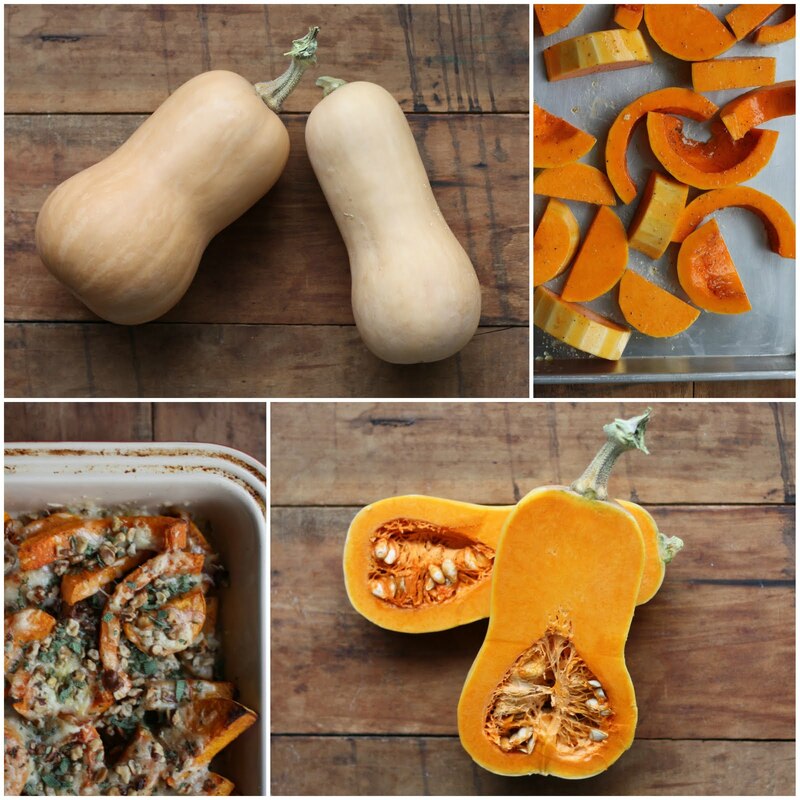 Slice the butternut squash into 1/2″ rounds, then quarter each round. Remove seeds. Toss the diced squash in the apple cider vinegar and two tablespoons of olive oil. Arrange on a large baking sheet and generously salt and pepper. Roast squash until cooked through but still firm, about 30-35 minutes. While the squash is roasting, caramelize the onions. Place in a medium skillet over a low flame. Cover, stirring occasionally, until the onions are soft and jammy, about 20-25 minutes. Remove squash from oven and set aside to cool, about ten minutes. Grease a medium cast-iron skillet or casserole dish. Arrange a layer of squash, followed by a layer of onions. Add the remaining squash. 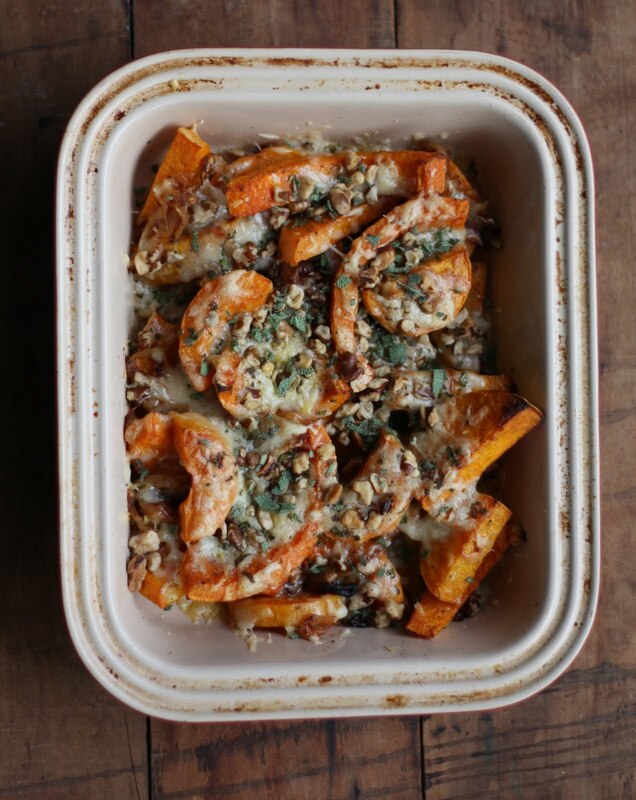 Sprinkle the Gruyere cheese evenly over the squash, followed by the toasted hazelnuts and one tablespoon of the sage. Bake the gratin until the cheese is golden and melted, about another 20 or 30 minutes. Remove from the oven, and top with the remaining sage. Wow, what an amazing recipe. I would definitely serve this as a fall side dish and it would even make the Thanksgiving or Christmas table side. Feel free to check out Kimberly Hasselbrink's other yummy creations! Fall is Friday here in Virginia so what are your go-to fall dishes that you just cannot wait to make? I had a butternut last season that lasted 6 months in my pantry. I got a tip from my CSA to extend winter squash's life: make an extremely weak bleach/water solution, perhaps a tablespoon in a half gallon of water. Then just wipe the skins of the winter squash with this solution and store normally. The bleach eliminates any microbes present on the exterior of the squash, so they don't have a head start at eating away at the rind. I did this with baking pumpkins, spaghetti squash, butternut, and acorn and had squash all winter. 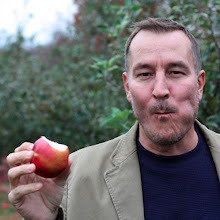 @Dzoli, I find it quite amazing you are getting ready for Spring. @Megan Carroll, great! Let us know how you like it. @Shannon, yes butternut squash soup is quite warming this time of year. @Megan, That is interesting tip that I am going to try when I get back from NYC. I agree with Megan, I can't wait to try this as a side dish although I usually use my butternut squash for delicious soups. I guess it just goes to show how versatile this wonderful veggie is. 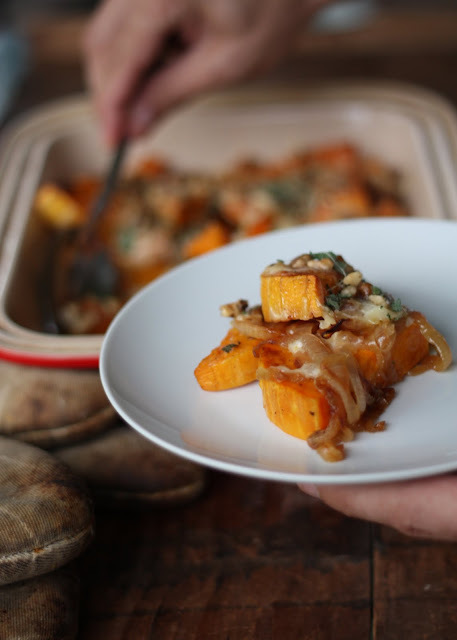 This dish has got to be excellent; the combo of caramelized onions and butternut, coupled with gruyère and the crunch of hazelnuts, why I can't think of a better pairing. I just found this recipe through your Pinterest board. It looks so good and I can't wait to try it. I've got two butternut squash just screaming to be cooked up and enjoyed :) Thanks so much for sharing this recipe! Megan thanks for stopping by and going to head over to check your site! Please stay in touch!